A healthy marriage is the result of much more than a stroke of good fortune, the accidental meeting of two "soul mates," or a conscious commitment to stay together no matter what. Studies have found that romantic, passionate love is often just a memory by the wedding, or within the first year of marriage. Creating an intimate, satisfying, and stable marriage is by no means easy or guaranteed--it requires thought, communication, planning, and true commitment to each other (though luck and compatibility never hurt). The window of opportunity in which to build the foundation for such a relationship is narrow, and does not often last too long after the first two years of a marriage. 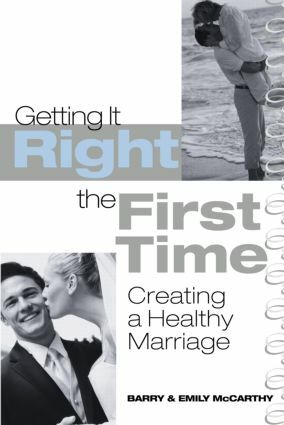 Getting it Right the First Time provides the information every couple needs to know to understand what really makes a marriage work. Husband and wife team, Barry and Emily McCarthy share clear, helpful guidelines for creating a healthy marriage and reveal the strategies, skills, and attitudes that can help prevent disappointment, resentment, and alienation from entering the relationship. Ask any happily married couple whether the time and effort spent in creating a healthy marriage has been worth it, and you should get a universal answer. Getting it Right the First Time can make getting there a little easier.